I always hear from parents with older children to enjoy our kids at this age because when they grow up, we will miss them. Yeah? My question is, does that include the fun of picking up every unimaginable object on the floor and putting them back in their proper places everytime I walk from one part of the house to another? Does that also include a hundred whinings a day from two different sources? While I am at it, does that also include the fun of rearranging the furniture every single day and three curtains being pulled down from the walls? I can go on and on about the horrors of keeping up with young children but I do know that when things quiet down at home, we will miss our action-packed days especially the protagonists of our daily action-drama stints. So here I am, half an hour later, at exactly 4:33 AM, typing this and speaking with my 2-year old daughter while she's analyzing my pajama button. She's wide awake, we are the only ones awake and she is giving me her full attention. In time, this will just be a memory between me and my daughter. Maybe for that reason, I am not pushing her so much in closing her eyes. I'll wait for her to fall asleep on my shoulder again, like most afternoons when she takes her naps. Let me collect these moments and file them in a growing folder of memories in my mind entitled "Sofia". I always say that stripping down to simplicity is best sought in life. But hey, I'm not that simple so a treat of lavishness here and there at times is fitting. That perspective is reflected in my kitchen. More commonly, my dishes are so simple to put together that they practically don't need recipes. On the other hand, my love for special ingredients from different places overtake me sometimes. 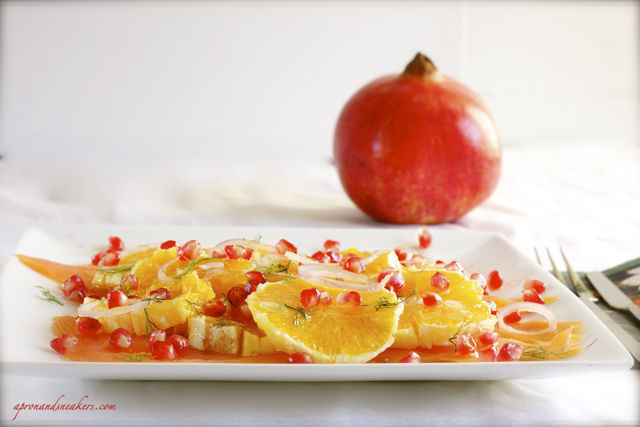 Here's a simple & delicious recipe for those days that you just need to run but pack yourself with something good & healthy. If you want it to be simpler, refer to my previous post with just 3 ingredients. 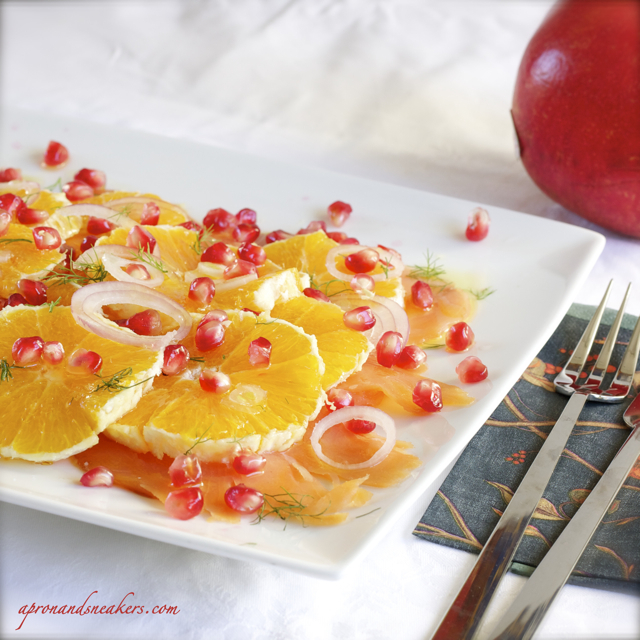 The insalata di arance (orange salad). Place the smoked salmon on the plate. 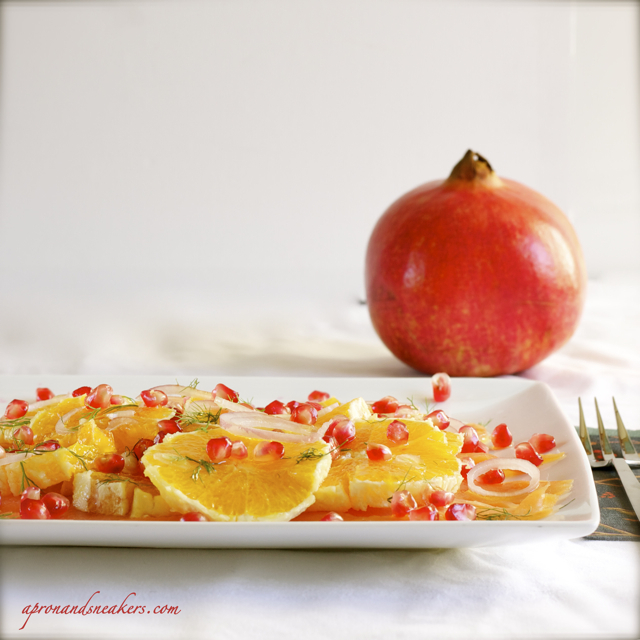 Follow with the sliced oranges, onions & pomegranate. Drizzle with extra virgin olive oil. Sprinkle with fennel leaves, salt & pepper.